We envisage many possible types of online phonetics course, varying in level and purpose from absolute beginners to postgraduate research and CPD for professionals such as Speech and Language Therapists. The pilot course focused on English Phonetics and was aimed at all those, whether teachers or students, undergraduate or postgraduate, who wished to acquire or renew knowledge and skills related to English phonetics. There is a ready worldwide market for this type of course as shown by our annual Summer Course in English Phonetics. The course was modular with eight units, one every week, each consisting of a tutorial material, self assessment exercises and guidance for further independent study. There were assignments including transcription exercises throughout the course, and a formal assessment at the end. A wide survey of printed and online resources was conducted, but at an early stage in development it was decided that no currently available textbook was entirely appropriate for the requirements of the course. Original material was written in the form of eight lectures, of which the text alone runs to 28,000 words. Lectures were provided on interactive course pages, with sound file links throughout (and as a backup, as printable pdf files). The consonant sounds of English — and of languages generally — are not just a random assortment of different sounds. As the grid layout of the IPA chart suggests, each consonant can be classified according to a small number of separate properties which together describe its production. The most important of these are voice, place and manner of articulation. keep the vocal folds apart, so that air flows between them without making them vibrate, but then encounters resistance and obstruction on its way out of the mouth, giving voiceless sounds. Examples of voiced sounds are English consonants such as [m n l w r z v], and also all English vowels and diphthongs. Examples of voiceless sounds are the English consonants [f s p t k h]. Like many languages, English makes use of the voicing contrast to distinguish otherwise identical consonant sounds. For example, the sounds [f] and [v] are alike in all respects except that [f] is voiceless and [v] is voiced. If, on a single breath, you alternate prolonged versions of the two in an uninterrupted sequence [fvfvfv], you should be able to feel, and to hear, that vocal fold vibration (voice) switches on for every example of [v], and off again for every [f]. Figure 2_1. Waveform and spectrogram for [fvfvfv]: adult male speaker. 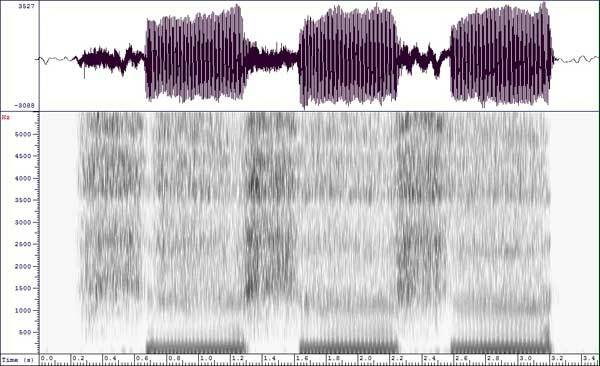 Voiced and voiceless speech sounds show characteristic differences when we examine their waveforms and spectrograms. Figure 2_1 shows the waveform and spectrogram for the [fvfvfv] sequence, with the speaker switching at intervals of about one second. There is continuous energy, indicating that there are no gaps between the sounds, but two different patterns are being alternated. The sequence starts with voiceless [f]. For this portion, the waveform is small and irregular, while the spectrogram shows a wide scatter of energy, but none at the very bottom of the frequency scale (the frequency scale is the vertical or y-axis). When voicing switches on for [v], the waveform becomes much larger. The spectrogram shows that the wide scatter of energy continues, but now with the addition of a strong band at the bottom of the frequency scale, which is striped (striated), corresponding to the regular pulsing of the vocal folds. In fact, they are vibrating at about 115 Hertz (Hz). Zooming-in on the one of the places where voicing switches off in this sequence, we see how the large fairly regular wave of the voiced sound gives way to the smaller random waveform of voiceless [f]. There are in total 24 English consonant sounds. Sixteen of these are in voiced/voiceless pairs. In the following array, the top line consists of voiceless sounds; the lower line shows the corresponding voiced sounds. Click here to try out some of these exercises. I was looking at the exercises in Unit 5, which seemed to be more challenging to me than before. Here are some of my thoughts on Question 3 which asks us to identify the problems, if any, with the transcriptions. 1. I couldn't believe you felt like that. aɪ ˈkʊgŋ bɪˈli:v ju ˈfel laɪk ˈðæt >>>> I think 'couldn't' was not transcribed right. I would put it as [ˈkʊgn] with alveolar plosive elision. I agree with [student 1] that something is wrong with /kʊgŋ/, but I think a different phonetic change would occur here. And "felt" would not undergo elision, so /felt/ should be the form. I thought I'd just drop a hint at this point. The whole motivation for doing an assimilation is to simplify the movements of the articulators, so for instance alveolar→bilabial before another bilabial avoids the movements necessary to switch from alveolar to bilabial. Consider the phrase "couldn't bear" [kʊdnt beə]. If we do the assimilation then we end up with [kʊdnp beə]. But this STILL contains a sequence alveolar + bilabial [np] so we haven't saved anything!!! I'm still not certain about alveolar stop assimilation, and I hope someone makes it clear to me. In Unit 5.2, it is said that "word-final alveolar stops may become bilabial stops before any labial at the beginning of the next word", so that "one way" becomes /wʌm weɪ/. However, in the transcription of LC09, "the sun was shining" is transcribed as /ðə sʌn wəʃ ʃaɪnɪŋ/, and in LC11, "men and women" is transcribed as /men ən wɪmɪn/. I wonder if this assimilation does not always occur, or if there is something else involved. All the connected speech processes — assimilation, elision, linking r, intrusive r — are OPTIONAL. Sometimes speakers do them, sometimes they don't. Each unit included an assignment to be submitted for grading. This made use of the VLE's standard provisions for controlling and logging assignments, though alternative forms of submission had to be catered for, corresponding to the different computers and software in use among participants. A two-tier system of detailed feedback was evolved, in which general feedback relevant to all students was accompanied by individual explanations aimed at each participant. The general feedback was kept available as a resource within the assignments area of the course. The main purpose of Assignment 1 was to practise using phonetic symbols in PHONLINE assignments, and familiarize you with making a submission and receiving feedback. If you feel that you have learned something from the process, then the assignment has been a success. ` wrongly for stress mark ˈ . If you are a PC user, you are strongly urged to install the Unicode Phonetic Keyboard (see "Getting Started"). This will automatically save you from most such mistakes. (No marks were deducted for this small point). We don't mark a stress on a one-syllable word in isolation. Conversely, if we look in a dictionary and see a word marked with a stress, that means that the word is regarded as having at least two syllables, even when that is otherwise not clear. For example, in OALD you will find fire transcribed /ˈfaɪə/, complete with a stress mark. The inclusion of the stress mark indicates that the editor believes the word has two syllables (not one, as might quite reasonably be thought). Of course, a monosyllabic word may get a rhythmic stress in connected speech — but in this exercise, we are transcribing isolated words. Give the following words in ordinary spelling (orthography). Transcriptions are given in RP.